Warmth in label design means warm colors, yes, but it also includes a more abstract concept of nostalgia and understanding or compassion. As fall quickly approaches, these warm tones and concepts fit perfectly for promotional label designs. Consider both how the colors and time of year (it’s back to school season after all) impact nostalgia also. As mentioned, it’s back-to-school season, so these cartoonish and gamified labels evoke that youthful sense of play and curiosity. The warm tones also evoke a cozy sense of comfort. As a result, it’s virtually impossible to look at this packaging without feeling happy. Powdered paint is an antique-style method, so it’s fitting the label reflects the history of the product. The sepia tones add that warmth through color, but the fact that it’s not a wrap-around label also allows the warmth of the yellow paint to shine through. Again, the vintage design style provides a sense of nostalgia that offers shoppers warm and fuzzy memories to pop into their minds. Minimalism doesn’t have to have a cold effect. These warm tones create beautiful warmth for the bottle purely as mixing warm and cool tones in the color wheel. However, the colors are reminiscent of sunsets, sunrises, and fires. Very warm and cozy, nostalgia-inducing moments indeed. This design goes to show you that you don’t have to work double time to create nostalgia. It’s all about implications and making connections. It’s the season of travel. So, why not use travel to inspire your next label design? These designs either incorporate motifs of transportation or represent something about the traveling experience. Use real-life experiences to influence design for an authentic touch. With the anchor motif and coordinates being front and center, this label makes you want to set sail. The Carribean and pirate influences are also quite apparent in this label. The transparent stock only serves to enhance the effect. This is the type of simple label that lets the brand voice make a strong, authentic impression. Again, the brand values take the focus in an innovative way. The tickets highlight the fact that The Body Shop prides itself on using fair trade ingredients. So, while each fragrance and logo is at the top, the eye is drawn to the global impact of the brand. It also transports the shopper to other lands while they smell the fragrance. “The branding reflects a woman’s love for romance, adventure and all things precious – solid gold capped mountains of the Scottish Highlands.” Says Wilson. Not only does this brand attract it’s demographic with a sense of adventure, it also avoids cliches! Best yet, it uses gorgeous gold foiling on the snowy peaks of the mountain motif. You don’t often see travel and luxury paired together, but they do it so brilliantly for Mayv. To celebrate Independence Day, we’re taking a look at stars and stripes in label design. So, see how to incorporate these simple motifs with flare. This subtly patriotic aesthetic makes the label suitable year-round. So, take inspiration from the holiday in a way that enhances your product. Although fun promotional labels help sell products, this focus is on the more practical nature of the symbols. This beer label heavily relies on matching Pantone colors with seasonal flavors. So, the font’s bold, slim design makes the whole concept pop. Although actual stripes aren’t involved, the font still replicates a striped look from a distance. Or, at a first glance, the label looks simplistic and color oriented. This design celebrates environmental elements with an extremely simplistic way. As a result, the lines illustrate hills, rain, sunlight and levels of ground. Plus, the lines offer a distinct look making it easy to identify each item with a glance. However, on an option to illuminate the white lines is to foil them. Although the concept is strong, the innovative labeling technique enhances the label. Now for stars. This concept makes first aid items bright and approachable for all demographics. In the case of this hydrogen peroxide label, the stars mimic the bubbling nature of the product. Again, color plays a major role in creating an approachable label. However, the practical requirements of the labeling are still there. So, this packaging design offers a balanced mix of professional label design and creative, eye-catching techniques. Spatially satisfying labels take advantage of the available space to do something pleasant to look at. These label designs don’t get lost in minimalism and they also don’t pack graphics and text in together. They even use unique shapes to enhance the shapes within the shape. There’s so much fantastic use of shape and space with this label. The repetition of the slanted lines compliments the herringbone style design and the lower left whitespace. Even the slanted nature of the fruit graphics create a cohesive balance. Plus, the lines draw the viewers’ eyes all over the label, taking in each detail. This beer label beautifully breaks the mold by finding the balance between bold and soft features. The title bursting out of the box is a fantastic example to focus attention on. The lines are soft and fluid while the shadow is angular and deep. This design uses the standard label shape and adds dimension solely with unique graphics. 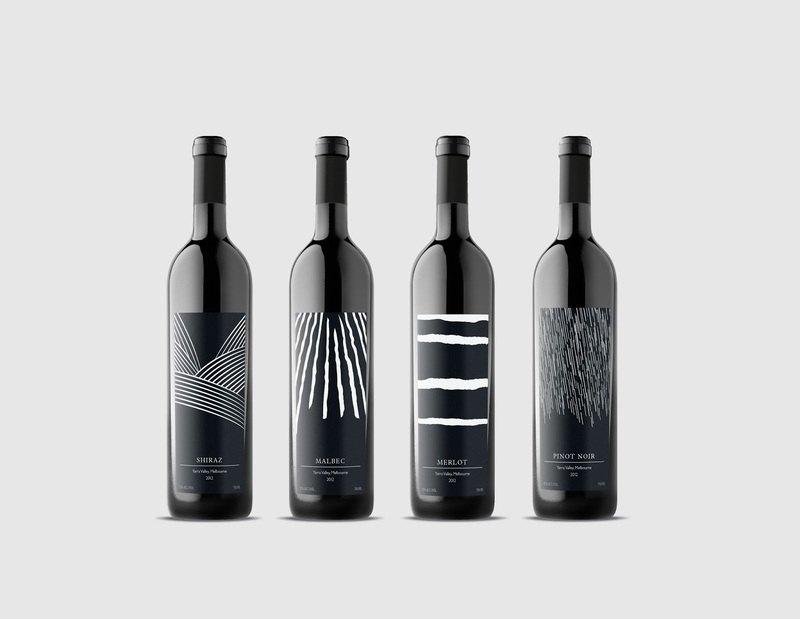 Unlike the previous two designs, this label uses more traditional lines but creates something beautiful and balanced from them. Even the foiled title draws the eyes down from the crisp, white graphic leaves on top. The flow of the lines in the leaves gets balanced by the angular serif fonts. This label is so timeless that it fits into any setting. It also makes for easy replication and adaptation for other products in the line. Fonts are important. Although this is stating the obvious, there are ways to elevate your brand with the font used on your labels. Whether your design is minimalistic, or vibrant and bold, pay attention to what your font says. Not just the words used, but how the style fits with the overall aesthetic. Whatever it’s communicating needs to align with your product and your brand. The calligraphy font used for Lumière pairs well with the beautiful, painted floral design used on the rest of the packaging. The foiling used over the title also fits since it implies handcrafted luxury. Due to the spacing, accompanying sans-serif fonts, and sizing of both the title and subtitles, the eye is drawn straight to the product name. This beauty line uses very different techniques to execute the handcrafted implications through label design. La Vall features minimalistic labels with sans-serif font that creates a simplistic aesthetic. It implies the product itself uses simplicity, perhaps even organic, ingredients to achieve beautiful results. One way to enhance the design would be to emboss the text or use a tactile coating to create depth. Beer design is over-saturated with bold, almost aggressive design. Golden Nectar scales things back to create a focus on the font. While the color is vibrant and the graphics are bold, it still offers a handcrafted look while keeping its design sophisticated. All labels allow the font take center stage which makes it even more important the font conveys the branded message. Should designers want the simplicity and elegance of a label like this, but the bold standard of other beer labels, they have metallic stock as an option. Doodles are major a labeling design trend for 2018. The messy, free, authentic aesthetic says a lot about a product or a brand. What are you conveying with your packaging? For handcrafted and unique product, doodles stand out. Get inspired by these label art concepts. Obviously, as an art product, the colorless scheme is designed to attract artists. The incomplete nature also evokes a sense of creation. Anything is still possible. If colored in, every person takes it in a different direction. Gives the design a different mood. So, it attracts the ideal demographic in the grocery aisle. The rougher nature of this design mirrors the raw, natural ingredients inside the can. You can tell there’s a simplicity with the product. So, when a customer picks up a can, they understand the product in seconds. Even the paper label stock provides a natural, vintage touch. The vintage style font also works well with the design. Unlike the raw messiness of the previous doodles, this design is clean and tidy. So, as I’m sure you’ll guess, it reflects the product and the demographic. The beer is a rich, sweet vanilla and caramel drink that isn’t one to be guzzled. Customers savor this beer. It’s also no surprise that the label design is one that’s free-flowing but also carefully drawn. The intricacy isn’t scribbled down. The lines and color scheme are carefully decided to compliment the bottle, the copy and the product itself. Learn even more about how we can bring your wildest label design concepts to life. So, download our Label Project Guide e-book. Building a customer relationship is an effective way to ensure return purchases. Humanize your brand through captivating labeling. Create those instantaneous connections through personalized imagery and innovative labeling techniques. Take simple, but also meaningful steps in creating designs your customers will love. Take a look at local influencers in your area. The above image is the best nine Instagram posts from The GR Guide. Notice how many local products and businesses are featured in their top nine images of 2017. By collaborating with local entrepreneurs such as social media influencers, you expand your reach and connect with the community on a more intimate level. Create personalized, promotional, one of a kind labels for collaborative prospects like these. This also is a fantastic way to create a community connection at special events. Even use their event hashtags in your design. As you may notice (particularly if you’re a Grand Rapidian), two of the best nine images shown above are from ArtPrize. ArtPrize is the biggest public art event in the world, by the way. So, local businesses who create ArtPrize specific labels for their products during that time are taking advantage of the buzz. On Monday we looked at ways brands tell stories with their labels. This is done through imagery, using a small section of space to write a short story, and through connecting customers to content with labeling technology. Again, locals make connections between your label using local sites, and their memories. They see what values the company holds. Or, they get a behind the scenes look at how the product was made, demystifying and informing them. As mentioned above, your customers are going to social media to share their experiences with brands. This is far more prominent in social media influencers, but also a part of the average user’s posts. Create hashtags for your label design to engage with your customer base. By giving your label a call to action, you give your brand an opportunity to nurture customer relationships. A secondary label specifically for the call to action is a great way to include the information without redesigning the label. It also prevents removing and reapplying labels (or also over-labeling). Instead of cultivating a generic release, creating a call to action allows individual engagement on social media. Create a contest associated with the promotion to garner more response. Then, create an on-going dialogue with your biggest fans. What can you offer them for their loyalty? Sharing their post on your social media page? Coupon code for a discount on thier next purchase? A special message from the heart in response? Whatever you do, make it sincere. Show them that you appreciate their loyalty. It doesn’t just happen on social media, however. Foster relationships by getting customers into your store. A secondary label, as mentioned, provides a simple way to display event information. Instead of the need to incorporate a link, it acts as a small ad your customers will take home with them. If the label is small enough and uses removable adhesive, it allows customers to apply the label to their calendar. Keep the label design simple. What is the most important information they need to know about your event? If there is a custom web page for the event, a link is great, but not necessary. Take the above horticulture secondary label as an example. The address is unnecessary when there is only one greenhouse store location. It just shows date, time and the hook. Customers don’t nees a web link or QR code when they already know how to find the greenhouse’s Facebook page. Simple, but effective. Haptic labeling is labeling that engages the senses. Studies show that by engaging certain memories, customers will create positive associations with your brand. If your label has a velvety smooth texture, they’ll feel a sense of comfort. So, use subtle ways to engage positive associations. Show your customers that you appreciate their patronage by giving back. Add a removable Instant Redeemable Coupon (IRC) to your packaging. It enhances the customer’s shopping experience while encouraging them to return to your store. IRCs also give you a leg up on your competition in the grocery aisle. When given the choice to receive a discount or not, the decision is a simple one. Again, social media plays a role in connecting with your customers when they post about using the voucher. Also, promote the label on social media to let followers know how long the promotion will last. You create three routes of relationship building with one promotion. Social media discovery, the positive association in the grocery store aisle and the follow up purchase using the discount. For many, as a new year begins, it’s time to look at the astrological forecast to see what 2018 has to offer. So, use the zodiac signs to design a new line of products, or reinvigorate a classic label with a new packaging twist. Those who connect with the practice will naturally gravitate to your idea of their perfect product. That said, there are three ways of approaching the label design task and catching customers’ attention. Herwig’s concept uses the literal imagery and names of the zodiac signs. This strategy directly captures the attention of each sign and makes it easy for them to connect with their appropriate flavor. Adding personalization to wine like this makes the product much more social media shareable. Customers will want to share their opinion on the accuracy of the product as well as share images of them using it in their environment. Each sign has its own symbol. These are motifs that draw the attention of each sign, similar to featuring the animal or zodiac name. These label designs aren’t making a reference to astrology. That said, the lines on the side of this bottle are reminiscent of Aquarius’ symbol. If your design uses minimalism, this is an opportunity to keep your simplistic style. To highlight the symbol or motif, use eye-catching labeling techniques such as the precise foiling technique, MiraFoil. A subtle and interpretive approach creates sophistication around the astrology theme. In this example, Prince’s use of color implies the Gemini duality. That said, this design was not created with the zodiac in mind. Imagine if these designs were each a side of the same bottle! The sign name could easily be included onto the label to make the simplicity crystal clear. Learn helpful marketing strategies to create labels that will also delight and surprise customers! So, download our e-book, The Marketing Guide here.